Parking rules in the Highway Code apply also to motorcycles. Detailed in this section are guides for how to park a motorcycle using safe and legal techniques. As a rider, you may well take a good deal of pride in your motorcycle and after parking up, expect to come back to find it the way you left it. Illegal, inappropriate or generally bad parking is in some form, something most of us are guilty of at some stage – even if it’s unintentional and down simply to absent mindedness. However, it might see your bike ticketed, have your machine knocked and damaged by another vehicle, or may even return to see that your bike has simply fallen over and sustained damage. We also need to consider security implications such as parking in an area which will reduce the likelihood of theft or vandalism and which devises may help to secure your vehicle. Let’s first take a look at some common issues riders can face when parking their motorcycle. In this age of congested roads and limited parking, it’s all too easy to ride into a parking area, relieved that you’ve found somewhere to park but haven’t quite considered how you’re going to get out. Depending on the weight of your motorcycle, parking on a slope can be an issue. Most bikes don’t have a reverse gear and require manoeuvring by physical effort alone and can be a mighty task pushing it up an incline. Consider not only how level the surface is, but how clean is it? Oil deposits may see you loose your footing, dropping your machine and potentially causing injury as well as damage to your vehicle. How Solid is the Surface? It’s obvious to most that parking your motorcycle on soft ground such as soil will almost certainly result in disaster, but the novice rider may not consider other surfaces such as tarmac or asphalt. Asphalt has largely replaced tarmac though both have a tendency to become soft in hot weather. If your bike falls over, it could injure a passer-by or damage another parked vehicle. 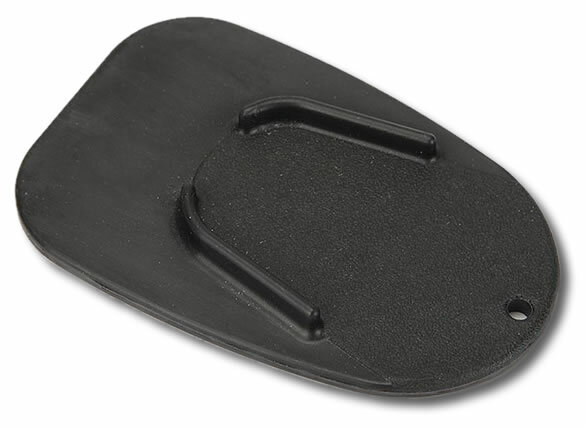 To avoid your kickstand sinking into a hot road surface and coming back to a toppled over bike, use a kickstand plate – also referred to as a kickstand puck or pad. They are cheap to purchase, are lightweight and should be carried around each time you ride. If you don’t have a kickstand plate at hand, a plastic cup coaster is better than nothing – at least until you get yourself a proper one. Just avoid using something metal at it’ll conduct heat and may melt the asphalt. If you are leaving your motorcycle for longer periods, use the centre stand other than the kick stand as it is more stable. Switch off the fuel tap and ensure you lock the steering and take the ignition key with you. The last thing you want is to return to where you parked your motorcycle, only to find it missing. In most towns, you’ll find designated areas specifically for motorcycles. These parking bays will usually have fixed metal stands for securing your bike against. Car parks may also have designated motorcycle bays. Motorcycle theft is quite common due to the relative ease in which a bike can be lifted into a van. Motorcycles can often be taken by thieves who literally drive around in a van looking for suitable bikes to lift. Don’t make your motorcycle interesting to thieves by securing it. If this isn’t an option and you intend on parking on the road, choose a busy area during the day. If you are leaving your vehicle over night, park it in a well-lit area. If you park within a specific area frequently, avoid if possible parking at the same location and instead rotate areas where you park. A thief can easily notice a bike parked in the same location. Ensure you take your possessions such as helmet and gloves with you after parking, even if it’s for a short period of time. Once you have parked your motorcycle, ensure you engage the steering lock. To prevent your machine being lifted, secure it using a high-tension steel cable or chain and use a high quality padlock Secure the chain around the wheel and an immovable object. For additional security, you may also wish to consider a u-lock or motorcycle disc lock. For added security, you may with to fit an alarm and/or an immobiliser to your motorcycle. A tracker may also prove beneficial to finding your machine in the event it gets stolen. Other than clearly marked parking areas such as those detailed above, you need to be careful. Councils gain huge revenue from issuing parking tickets, particularly in large towns and cities. It might seem harmless to quickly hop off your bike for a few minutes without first assessing parking legalities, but with Parking / Traffic Wardens around each corner and CCTV almost everywhere, it’s a high risk approach. Always avoid double red and double yellow lines. Parking is prohibited either side of the lines, so parking on a verge or pavement will still get you ticketed. You can sometimes park on single yellow lines, though the times in which you are permitted to do so are displayed on roadside signs. Motorcycles parking in cycle bays is a somewhat gray area depending on the area of council jurisdiction. There are no specific rules that dictate motorcyclists cannot park in bicycle bays, however if the bicycle bays are off-road in a pedestrianised area, it’s probably best avoided as it will require you riding over a pedestrian area / pavement. Even if it doesn’t require riding into a pedestrianised area, it’s still a risk, so be prepared for a ticket when you return. Parking a motorcycle on the pavement in London is illegal – simple as that, unless there is specific signage that allows partial pavement parking. Outside of London, it’s a very different situation. Providing there is no active parking enforcement such as double yellow lines for example, then councils are powerless to issue tickets to vehicles parked on the pavement – that doesn’t mean to say that you will not get in trouble though. Parking on a pavement can be considered inconsiderate and hazardous to pedestrians, particularly the partially sighted, the elderly, wheelchair users and those using a pushchair. This can be considered an obstruction of the highway and is a matter for the police to deal with who might issue you with a fixed penalty notice.